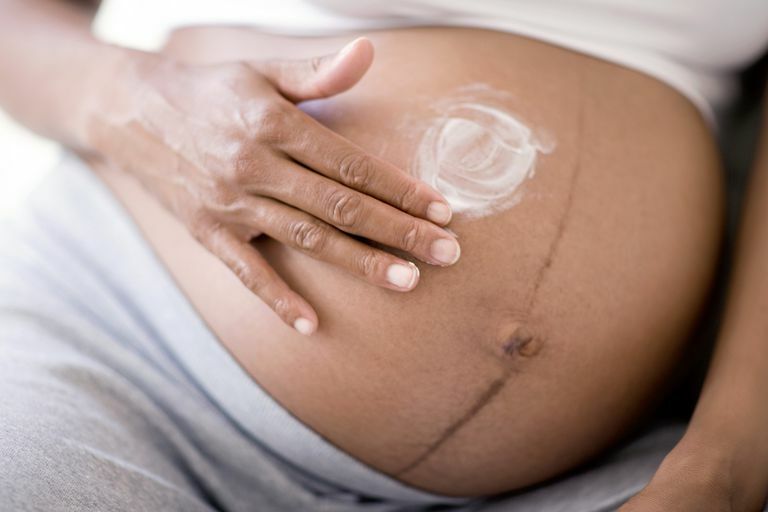 Are you pregnant and experiencing a rash on your body? Pruritic urticarial papules and plaques of pregnancy (PUPPP), also known as polymorphic eruption of pregnancy, is the most common rash in pregnant women. (Note: The condition can also be called PUPPS or PEP.) It normally occurs in a woman's first pregnancy, during the third trimester (with an average onset of 35 weeks), or to mothers-to-be who are carrying multiples. Thankfully, PUPPP does not usually affect subsequent pregnancies. The rash of PUPPP almost always begins in the stretch marks (striae) of the abdomen. It does not involve the belly button, which is how doctors are able to distinguish the symptoms from other common rashes of pregnancy. The rash is pruritic (an unpleasant sensation of the skin that gives you the urge to scratch it), hence its name. This condition is harmless to the mother-to-be and the baby, but it can be very annoying. It lasts an average of six weeks and resolves by itself one to two weeks after delivery. The most severe itching normally lasts for no more than one week. The cause of PUPPP is unknown. It is not associated with preeclampsia, autoimmune disorders, hormonal abnormalities, or fetal abnormalities. Although higher levels of the male fetal DNA can be found in skin biopsies of the rash. Since approximately 70 percent of women with PUPPP give birth to boys, it has been hypothesized that male fetal DNA may act as a skin irritant. Pregnancies with increased maternal weight are also associated with PUPPP, causing some researchers to suggest that the rapid abdominal wall growth and stretching damages connective tissue, causing an inflammatory response. There are no laboratory tests that detect PUPPP, so the diagnosis of PUPPP is clinical, meaning it is based solely on the appearance of the rash. Skin biopsies are not generally performed unless there is a question about the diagnosis. The treatment of PUPPP is symptomatic. This means that medication is given to relieve the rash and reduce itching, including the following. High-strength steroid creams or ointments may be prescribed to relieve itching and prevent the spread of the rash. Once the rash is under control, changing to a lower-strength steroid that's used less frequently is advisable. Oral antihistamines such as Atarax, Benadryl, and Zyrtec are generally less effective for itching than steroids but may be useful at night to help with sleep. Oral steroids are generally avoided during pregnancy, but they may be necessary to control itching for extremely severe cases. Your doctor may also consider inducing labor (if you are close to your delivery date and the itching is extreme) instead of starting you on a dose of oral steroids. Keep this in mind: While it's frustrating and uncomfortable, PUPPP does clear up within a couple of weeks after delivery. It also poses no long-term harm to you or your baby. American College of Obstetrics and Gynecologists. (June 2014). Skin Conditions During Pregnancy. Brzoa, Z., Kasperska-Zajac, A., Oleś, E., Rogala, B. (2007). Pruritic urticarial papules and plaques of pregnancy. J Midwifery Womens Health, Jan-Feb, 52(1), 44-8. Tunzi, M., Gray, G.R. (2007). Common Skin Conditions During Pregnancy. Am Fam Physician, Jan, 75, 2, 211-18.